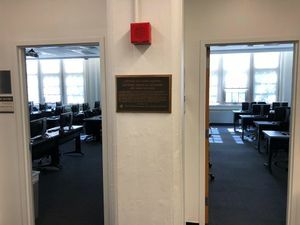 The plaque can be viewed at the Moore School of Electrical Engineering, at the University of Pennsylvania, Philadelphia, U.S.A., next to the door to the classroom where ENIAC was built. On 14 February 1946, the New York Times announced the unveiling of "an amazing machine that applies electronic speeds for the first time to mathematical tasks hitherto too difficult and cumbersome for solution... Leaders who saw the device in action for the first time," the report continued "heralded it as a tool with which to begin to rebuild scientific affairs on new foundations." With those words, the world´s first large-scale electronic general-purpose digital computer, developed at The Moore School of Electrical Engineering at the University of Pennsylvania in Philadelphia, emerged from the wraps of secrecy under which it had been constructed in the last years of World War II. ENIAC (Electronic Numerical Integrator and Computer) was completed in 1945. Its first major job, finished in a little over two hours, would have required many years of labor to perform by conventional calculating methods. That task, assigned to the ENIAC on its first test run, involved many thousand computations connected with top-secret studies on thermonuclear reactions. While many projects were scrapped at the end of the war, the ENIAC had proven to be significant for military research at Los Alamos as well as the Ballistic Research Laboratory in neighboring Maryland. 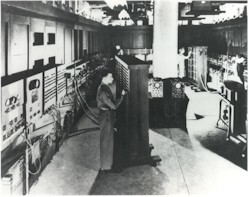 ENIAC was built at the Moore School, under a contract with the U.S. Army. The machine contained more than 18,000 vacuum tubes, which were cooled through the use of eighty air blowers. It measured 8 feet high, 3 feet wide and almost one hundred feet long, filled a 30-by-50 foot room, and weighed thirty tons. In much the same way that the airplane expanded man´s physical domain, this invention extended the capacity of human reason. In the brief span since its inception, individuals have explored our nearest planets, walked on the moon, and revolutionized the business, scientific and engineering worlds. It´s a far cry from today´s laptops and PDA´s. This page was last edited on 29 May 2018, at 13:32.